...in the Keane household, of all places. 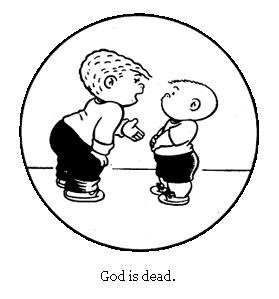 This humorous little web site "pairs a randomized Family Circus cartoon with a randomized Friedrich Nietzsche quote." Come on. A cheery, family-friendly cartoon merged with the dark, disturbing musings of a German philosopher? How could that not be funny? Funny! This finally makes "Family Circus" worth reading! I remember back in college I was once interested in a girl, but when we found out her favorite cartoon was "Family Circus", and mine was "The Far Side", we never dated.